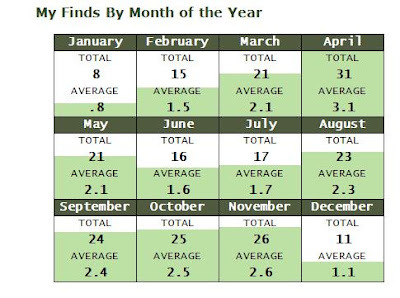 Not surprisingly, December/January/February tend to be my slowest months geocaching. 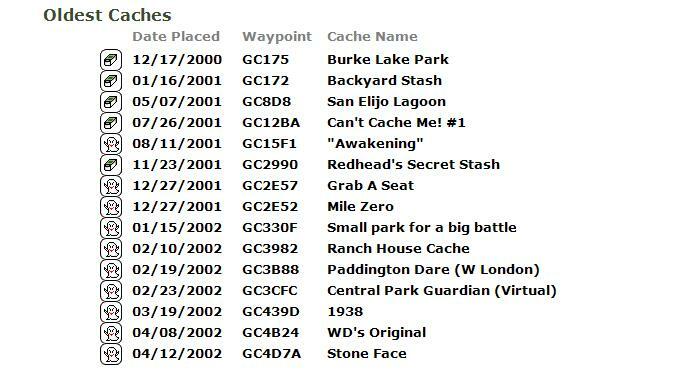 (Keep in mind that the ten years represented here include a lot of years where I only found one or two caches.) The weather tends to want to keep me in my car rather that out searching. This year, March was mostly lousy around here too, so I ended up only finding 3 caches in February and 6 in March. Two of the caches I claimed were FTFs, and the other almost was. On that one, I was poking around for a while when another cacher showed up with his daughter. I said hi and explained my thought process about where I had searched. He ended up finding it in one of the places I had previously looked; I guess I wasn't thorough enough. There's probably a lesson in there somewhere. Too bad I missed it, as it would have been my first Montgomery County FTF. Anyway, all three were hidden in February 2017, so that was an easy month to cross off and keep myself even on the months found (Jasmer) challenge. On one of the FTFs, I left a geocoin of mine that had finally resurfaced after many years in the house. 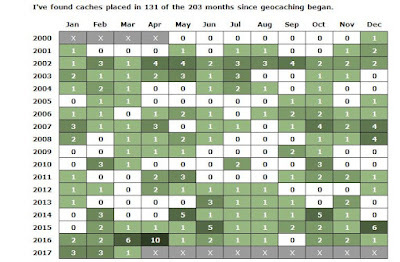 I used to enjoy tracking them, but I haven't found any since I've started caching in earnest again. Sadly, though someone picked it up the next day and promised to move it along, he hasn't. I should probably send him a message. Also on that FTF, it was the first 3.0/3.0 difficulty/terrain combo I'd found, bringing me to 29 out of 81 combos needed for the D/T (Fizzy) challenge. It was probably not appropriately rated, but I'll take it. 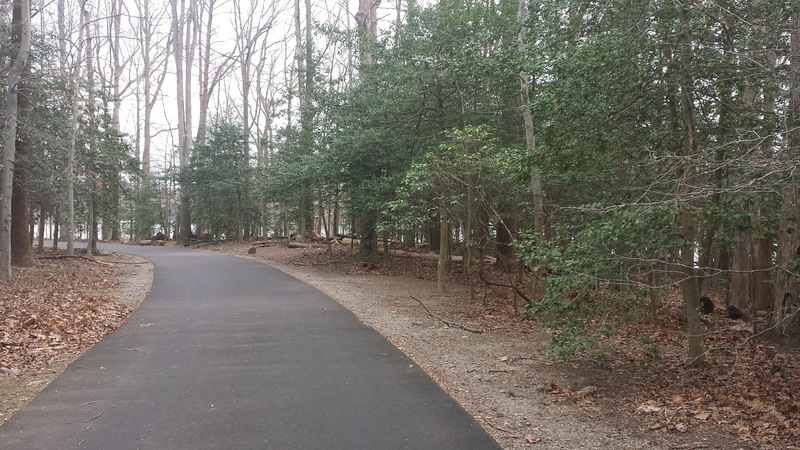 March opened with the grabbing of a couple random Anne Arundel County caches. They were targets of opportunity, but one of them happened to be an August 2013 cache, which was a month I was missing. Since I had yet to find a March 2017 one, that kept me where I was at the end of January with 75 missing months. After that it was time for a "historic" cache. 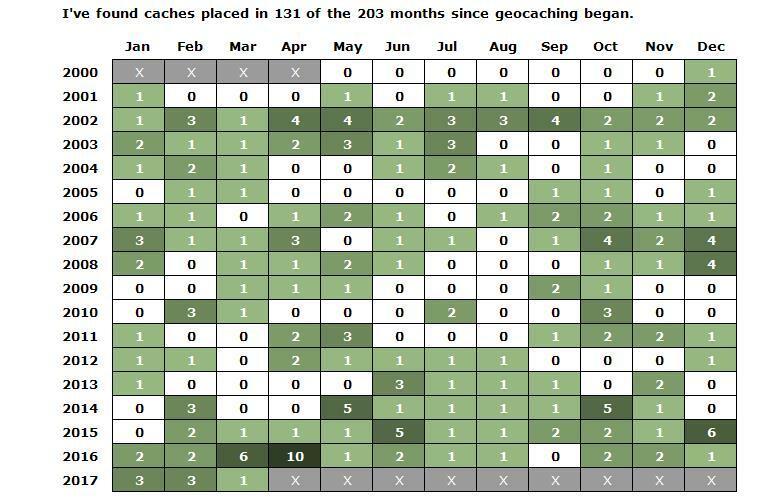 Geocaching has only been around since May 2000, so caches from 2000 are rare. In fact, there's only one in the State of Virginia. So when I was driving nearby, I decided to cross this one off my to do list. 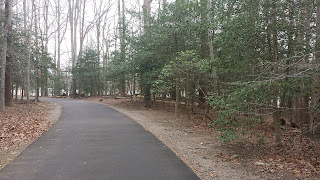 It was nice enough, but hardly a challenge -- the hint says it is "8 paces from the exact center of the road" (pictured). So that was my first cache from December 2000 (down to 74 missing months) and my first cache at N 38° 45'. Because of a bug, I had a heck of a time attaching the above picture to my log. That reminded me why I don't take pictures more often, even though I think they improve logs (and these blog entries). The bug is supposed to have been fixed, so maybe I'll try to do that more often. The next day, I had a "I need to get of the car and stretch" moment, and luckily there was a cache nearby. Quick and pleasant, it was my first cache in N 38° 46. The day after that, I snagged my first March FTF, and my tenth overall. That also meant I was down to 73 missing months. I closed out the month with a find on another old cache. 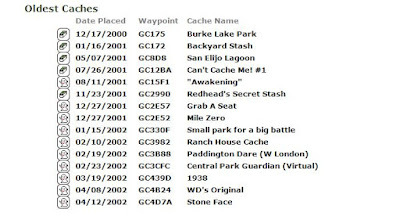 From July 2001, it's the 17th oldest active cache in Virginia. (I have also previously found the 3rd oldest.) It was somewhat underwhelming. The original container is long gone, and it isn't really being maintained any more, so there's a camouflaged pill bottle with a soggy log inside. But still, down to 72 missing months. And I found two of the four oldest ones I've found in March, so that's something.